Not much is known about St. Jude Thaddeus and his name is mentioned only a limited number of times in the New Testament. He is described by Matthew in the gospels as one of the “brethren” of Jesus, most likely his cousin. The Epistle of Jude mentions that it is written by Jude, a servant of Jesus Christ and a brother of James. St. Jude Thaddeus is also known as Judas or Judas Thaddeus and for this he is often mistaken to be Judas Iscariot, the apostle who betrayed Jesus before he was crucified. Because of this some translators of the New Testament used the name Jude in order to distinguish him from Judas. He is also known by other names including Jude of James, Jude the brother of James and Lebbaeus. St. Jude Thaddeus was born to Mary who is the cousin of Jesus’ own mother, Mary. His father Cleophas, was the brother of St. Joseph. St. Jude was married and had at least one child. There are references about him having grandchildren who lived as late as 95 A.D.
As one of the twelve apostles of Jesus, St. Jude Thaddeus preached the good news of Jesus throughout Galilee, Samaria and Judea. In 37 A.D., he traveled to Mesopotamia which is known today as Iraq. There he became a leader of the Church of the East, a church that St. Thomas founded. St. Jude Thaddeus also journeyed across Libya, Turkey, Persia and Mesopotamia with St. Simon. Together they preached the good news and led many people to Christianity. He is often credited as having helped start the Armenian Church and other congregations outside the Roman Empire. In 60 A.D., St. Jude wrote a letter to newly converted Christians in the Eastern Church who were suffering persecution. In his letter he warned them to be careful of the false teachers of the current day who were spreading wrong teachings about Christianity. He encouraged them to keep persevering and to stand firm in their faith in the midst of the harsh realities that they were facing. 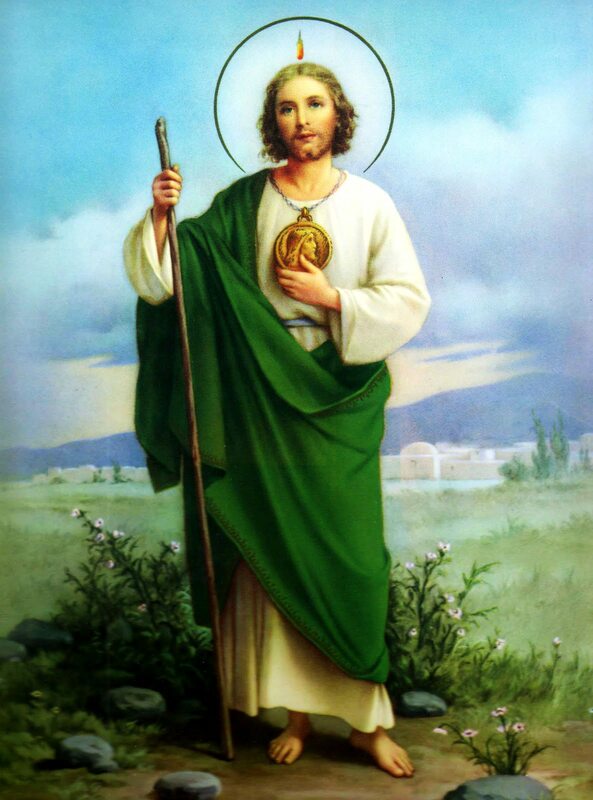 In spite of the widespread persecutions of Christians during his time, St. Jude Thaddeus stood by his beliefs and ultimately paid the price for his faith. He is believed to have been martyred either in Persia or Syria sometime in 65 A.D. In religious art, he is often shown holding an axe or club which symbolizes the way he was martyred. After his death, the apostle’s body was transported to Rome and placed in a crypt under St. Peter’s Basilica. Today his bones are kept in the left transept of St. Peter’s Basilica, under the main altar of St. Joseph, in one tomb that holds the remains of the apostle Simon the Zealot. To this day, many devotees visit the site as a sign of respect and admiration. Because of his steadfast faith, St. Jude Thaddeus is invoked as the patron saint of hopeless cases and desperate situations. 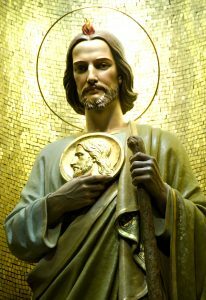 In religious art St. Jude is traditionally portrayed carrying an image of Jesus in his hand or holding it close to his chest. This depiction is taken from a Biblical story in which the King Abgar, the ruler of Edessa, a city located in what is now known as Southeast Turkey, became inflicted with leprosy. Because of his illness, he asked Jesus for healing and sent out an artist to bring him a drawing of Jesus. Abgar’s great faith impressed Jesus so much that he pressed his face into a cloth so that it could be taken to the king. He gave the cloth to St. Jude so that he could hand it over to Abgar. When the king saw Jesus’ image he was immediately cured from leprosy. He then converted to Christianity and the majority of the people under his rule followed. The cloth that miraculously healed King Abgar is known today as the the Image of Edessa. This holy relic is all association with the world-renowned Shroud of Jesus which is currently on display in Turn, Italy. Aside from the Image of Edessa, some portrayals of St. Jude Thaddeus also show him with a flame around his head which is symbolic of his presence at Pentecost in which he received the Holy Spirit together with the other apostles. He is also depicted holding an axe or club, a reminder of his martyrdom and other items such as a scroll or book symbolizing the Epistle of Jude or a carpenter’s rule. Have you asked Saint Jude for his intercession? Has his life inspired you to be a better Christian?